This is EIA data from 2005 showing the average end-use of energy within households. I haven't found time series data for household energy use at present. I note that my house compares quite unfavorably to the average. I assume that's a function a) of it being an old house, b) of us being a five person household - roughly twice the current average household size, and c) of us being in a colder climate than the northeast average. Not surprising that you're above average within the Northeast region. That average is going to be dominated by large numbers of households much closer to the coast, which have a number of "advantages" in terms of energy efficiency. I live in the West and our household is a bit above the average usage shown. We would be well below except for space heating. In the West, the average for space heating is weighted towards Arizona and the coastal areas of California, Oregon, Washington; our winters are not that mild. Still, this looks like another nail in the coffin of the oft-cited myth of Northeast energy efficiency. In 2005, the states in the US Eastern Interconnect generated more than three times as much electricity per capita as the states in the Western Interconnect, and almost twice as much per capita as Texas. Given the minimal transfers between the three interconnects, usage follows generation pretty closely. I'd like to do breakdowns within interconnects, but that's much harder: for example, Wyoming looks terrible based on per-capita generation, but much of that power is being sold as far away as California. The stacks are another instance of the argument I make that different regions of the country require very different energy policies. 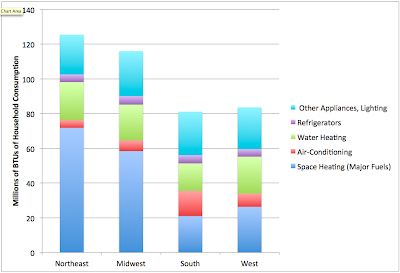 The most bang for the buck in the residential NE and Midwest would appear to be in space heating; the South and West would need to put their focus elsewhere. Looks to me like there is a significant negative feedabck here which I bet is not incorporated in Global Warming models. As temperatures rise the energy spent on space heating goes down. 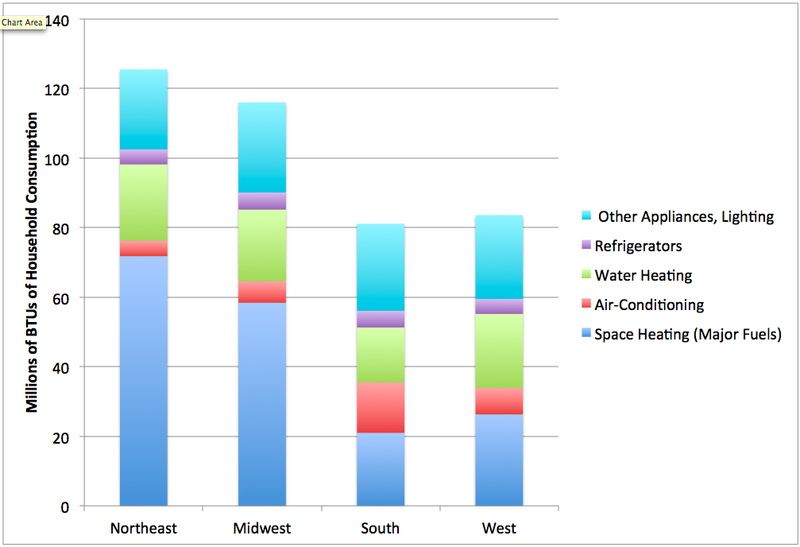 Interesting that air conditioning still takes up less of a slice than home heating, even in the warm south. Graphic actually covers only home energy use. Recent Berkeley study includes such things as buying stuff, entertainment, and transportation (ouch).